picturesque setting. The Loch is regarded by many as one of the best small waters in the Central Belt of Scotland , and regulars to the Loch come regularly from far and near to enjoy the good fishing and friendly atmosphere amongst that exists between the Anglers and the Owners of the Loch,The Loch is 4.1/2 acres and has a good natural head of brown and tench keep the water clean. Please Check out the Fishing reports page on this site , it is updated every week and will give you an insight into what and who is catching the fish. During very cold spells in winter it is advisable to check with Elizabeth Jackson on 01764 682287 if the Loch is Ice Free. 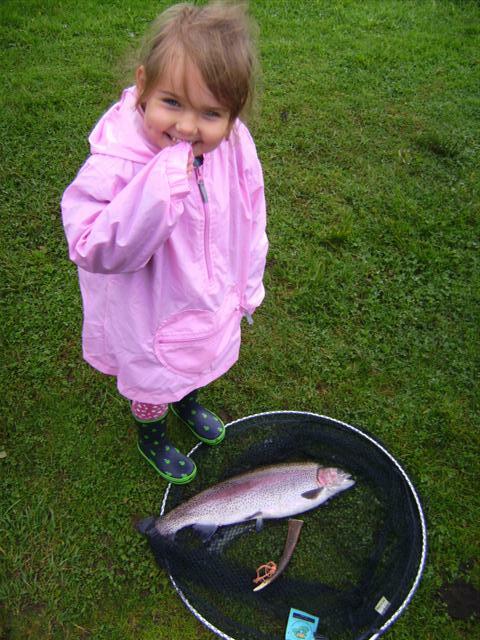 Young Samantha was showing her Grampa how to catch fish. Group and Club Bookings can be accepted, but book early to avoid disappointment. see ticket page for contact details. The water has easy acess from the car park and has wooden stands suitable for wheel chairs. There are two boats available for hire, £5.00 extra for two anglers. There is a chalet for anglers use with free tea and coffee and a cooker and microwave.